Personalised candle complete with customised satin ribbon. Personalised candle complete with customised satin ribbon. A lovely gift for many special occasions such as birthdays, weddings, anniversaries, Christenings or communion ceremonies, congratulations and good luck. The candle is traditional ivory pillar style candle that measures 80mm diameter and 100mm height. 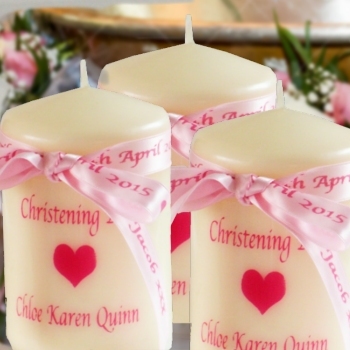 The candle can be personalised with a name, names or brief message in a font style and text colour of your choice. We have a selection of motifs you can choose from or you can have just the wording only. The printed satin ribbon can be personalised with a name or little message. Perhaps this can say who the gift is to and from! Please fill in each of the text boxes with the wording you would like on the candle and the wording you want on the ribbon. Select a text colour and we will coordinate the ribbon colour so the text shows up nicely. Please note: Remove the ribbon and printed film before burning the candle. Supervise children at all times when burning a candle. A special keepsake gift perfect for men or women and any special occasion.